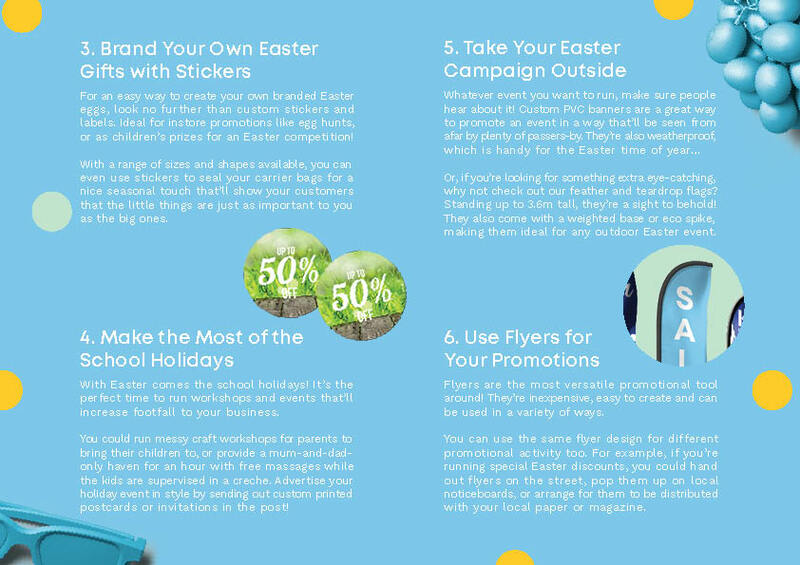 Seasonal marketing can be hard to get your head around – so we’ve come up with this handy cheat sheet to help you make the most of Easter promotions! 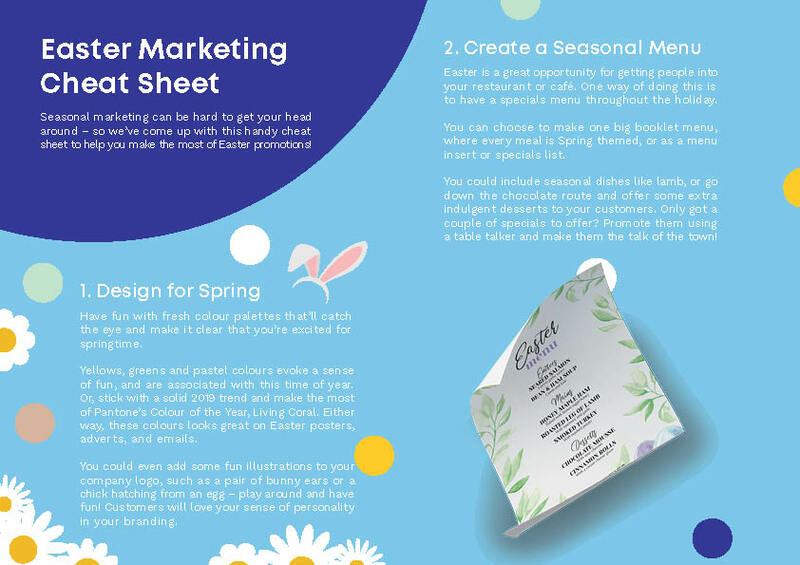 Click here to download a copy of our favourite Easter marketing ideas for 2019. Have fun with fresh colour palettes that’ll catch the eye and make it clear that you’re excited for springtime. Yellows, greens and pastel colours evoke a sense of fun, and are associated with this time of year. Or, stick with a solid 2019 trend and make the most of Pantone’s Colour of the Year, Living Coral. Either way, these colours looks great on Easter posters, adverts, and emails. 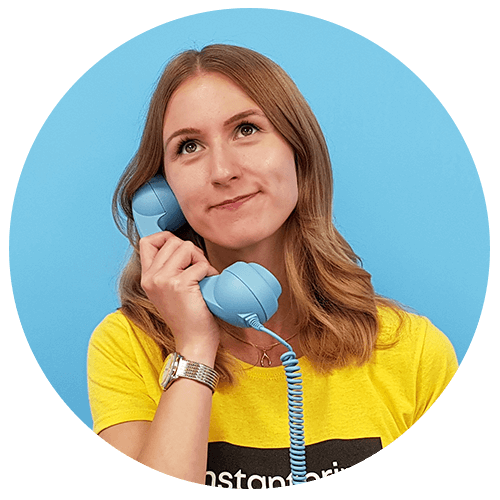 You could even add some fun illustrations to your company logo, such as a pair of bunny ears or a chick hatching from an egg – play around and have fun! Customers will love your sense of personality in your branding. Easter is a great opportunity for getting people into your restaurant or café. One way of doing this is to have a specials menu throughout the holiday. You can choose to make one big booklet menu, where every meal is Spring themed, or as a menu insert or specials list. You could include seasonal dishes like lamb, or go down the chocolate route and offer some extra indulgent desserts to your customers. Only got a couple of specials to offer? Promote them using a table talker and make them the talk of the town! For an easy way to create your own branded Easter eggs, look no further than custom stickers and labels. Ideal for instore promotions like egg hunts, or as children’s prizes for an Easter competition! With a range of sizes and shapes available, you can even use stickers to seal your carrier bags for a nice seasonal touch that’ll show your customers that the little things are just as important to you as the big ones. With Easter comes the school holidays! It’s the perfect time to run workshops and events that’ll increase footfall to your business. You could run messy craft workshops for parents to bring their children to, or provide a mum-and-dad-only haven for an hour with free massages while the kids are supervised in a creche. Advertise your holiday event in style by sending out custom printed postcards or invitations in the post! Or, if you’re looking for something extra eye-catching, why not check out our feather and teardrop flags? Standing up to 3.6m tall, they’re a sight to behold! They also come with a weighted base or eco spike, making them ideal for any outdoor Easter event. Flyers are the most versatile promotional tool around! They’re inexpensive, easy to create and can be used in a variety of ways. You can use the same flyer design for different promotional activity too. For example, if you’re running special Easter discounts, you could hand out flyers on the street, pop them up on local noticeboards, or arrange for them to be distributed with your local paper or magazine.